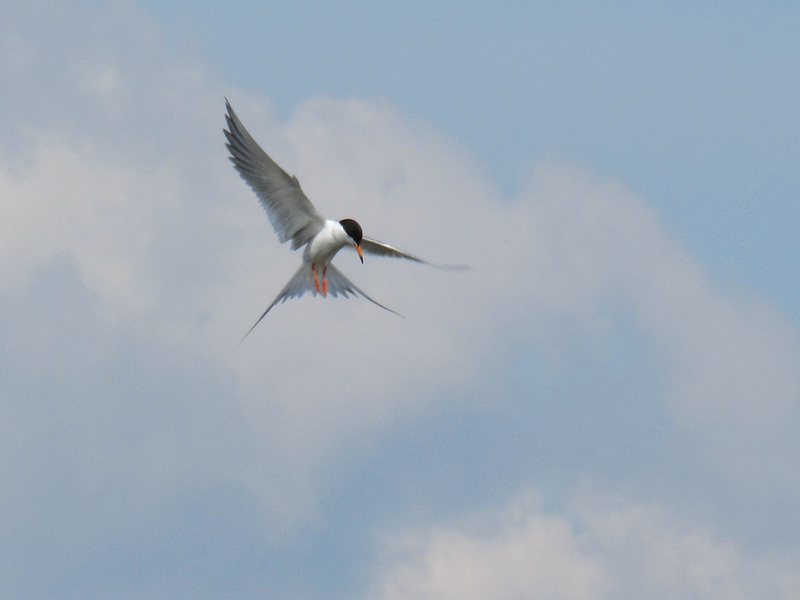 Frank Lake – A Tern!!! Frank Lake is a wetland 50 km southeast of Calgary which sustains a large variety of waterbirds. J and I went for the first time on July 2nd. I learned about the lake from the Birds Calgary blog, where, throughout the spring, a few birders posted awesome photos of birds I’d never seen before. 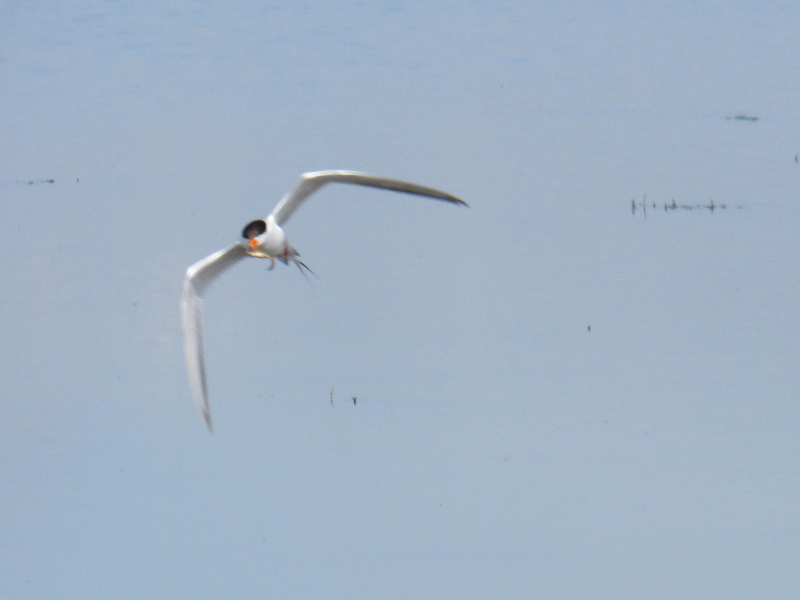 Along with other new-to-us birds, J and I saw a few Forster’s Terns. 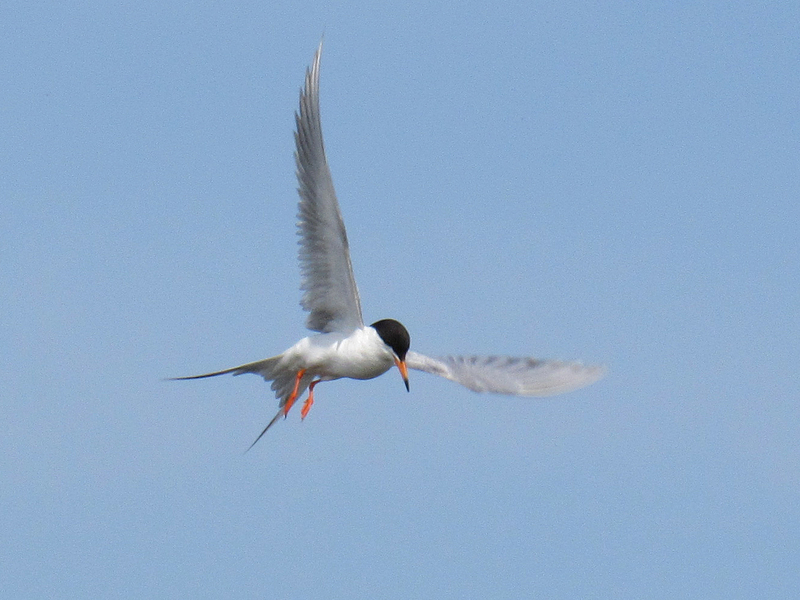 The absence of black markings on the primaries and a medium orange bill (instead of red like the legs) indicate that the terns are Forster’s not Common. 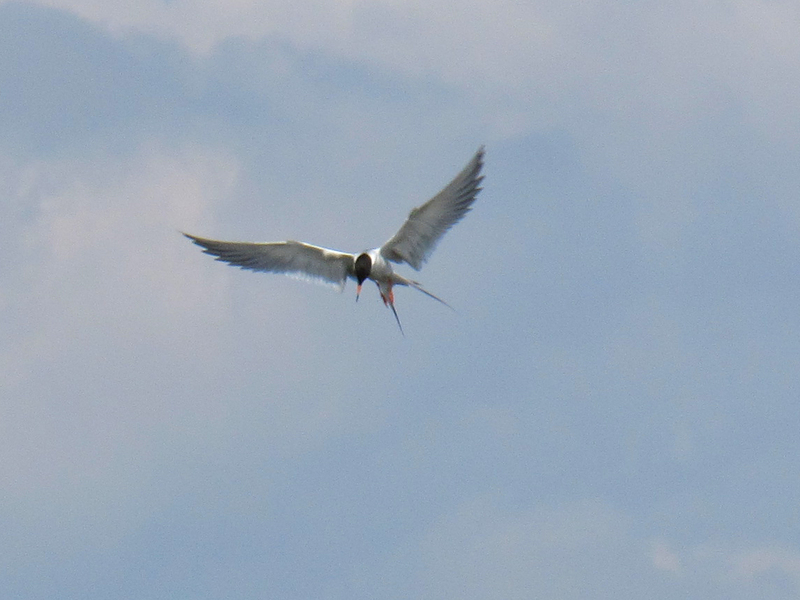 The terns put on a beautiful show flying over the lake, hovering in places and diving to catch small fish. Their wings and tail assumed spectacular shapes when the birds hovered. Fuzzy photo, but proof that someone caught a fish! These terns are absolutely fabulous, would you mind if I attempt to paint one of the images? They’re gorgeous and your images are so painterly! We get the Terns in the Spring. They’re fun to watch swooping, and diving aren’t they. Thanks for your lovely comment, Deborah :-). They are a treat to watch and it makes me smile that you’ve also watched them in California. I don’t have the skill to take crisp shots of flying birds, but the cloudy background that day helped a lot with the photo quality. You do have the skills to take crisp images! The clouds and soft blue of the sky with those striking black and white terns were just lovely, and you caught that with your skill, and you had the right gear to get it done. Very nice shots! I really like the first one. It reminds me of an X-Wing from Star Wars. Thanks for your lovely comment, Chi :-). Interesting X-Wing comparison – I always find it neat when a bird’s flight reminds me of some kind of aircraft. Wow, these are wonderful shots! Nothing better than a bird in flight….and such a beauty! Thanks so much for your appreciation, Laura :-). I’m still pretty excited about how cool these birds look in flight. Beautiful photos—as usual! I love the way their wings and tail feathers mark an “X” in the sky. The birds also make me think of little sea sprites. Very cute! Thanks for the awesome compliment, Michael :-). I like your sea sprite comparison. I’m always delighted by the large variety of ways birds can be functional and beautiful. Stunning photographs! Some look as if their wings were painted on a sky blue canvas. Wonderful stills of grace and beauty…Thank you so much for sharing your visit to the lake. Thanks so much for your lovely words, Haunani :-). I could feel the “bird freedom” of a fishing tern in your July watercolour paintings – that sense of immensity, grace and beauty and of connection to the elements (air, water, earth…). You are as kind and generous as your are talented. Blush :-D! Thanks. I was simply expressing my delight at seeing your paintings. I admire your skill with watercolours and feel a beautiful connection to your subjects. I am knocked out by these photos. The second one especially~I keep going back to gaze at it. Just lovely! 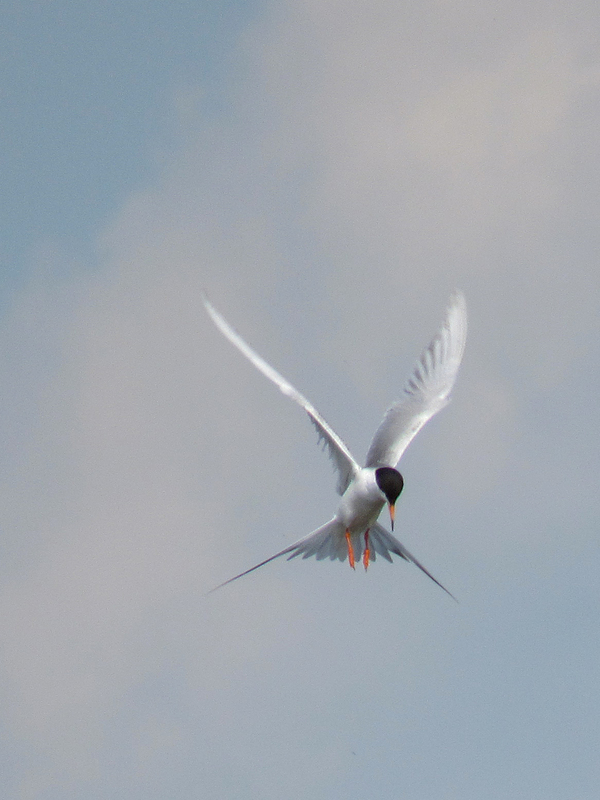 Terns are so swift in the air, beautiful to watch but not easy to capture. Your photos are great Myriam. Thanks for your lovely compliment, Jet :-). Delighted to read that you’ve also enjoyed watching terns.